This bright red wooden building used to be the heart of a rural New Hampshire town. Now, its two rooms are chock full of memories and mementoes, reflections of an era gone by. 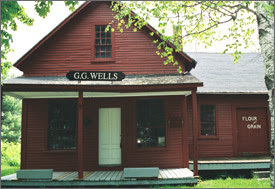 South Sutton’s general store, “George G. Wells Company” by name, is now the Old Store Museum. “The post office was right in that corner, and the rest of this was merchandise of various kinds,” says George Wells. “We sold everything. Groceries, meat, eggs, coffee, tea, dry goods, clothes, wallpaper, paint, hardware, farm implements, everything. If somebody needed a bathtub, we would order it through a wholesaler in Concord. The storekeeper was the guy who took care of the village.” He should know; the now 84-year-old Wells spent much of his childhood in the store, which was the family business for many decades. — The Rosewood Country Inn and the Candlelite Inn join together to offer an Inn to Inn Summer Heritage Tour. The 4-night package offers two days of biking through central New Hampshire’s beautiful scenery, charming villages, bucolic meadows and farmlands, and two days of exploring the Sunapee region by car. The package is available from June 29 to July 3 and from August 10 to August 14. Guests will stay the first two nights at the Rosewood Country Inn, followed by two nights at the Candlelite Inn. Day 3 & 4 – Explore the Mt. Sunapee/ Kearsarge area by car. Take in the Kearsarge Indian Museum, hike Mt. Kearsarge, or explore the local artisan shops. *On Saturday for the July tour, guests will enjoy an old time 4th of July fair in the town of Bradford and an evening barbecue back at the Candlelite Inn before the fireworks. **The August tour will include a Saturday and Sunday admission to the League of NH Craftsmen's Fair at Mt. Sunapee Resort. The League of NH Craftsmen's Fair is one of the finest, most prestigious craft events in the country today. This annual nine-day event features both traditional and contemporary fine craft work by juried members of the League of New Hampshire Craftsmen. For reservations, contact the Rosewood Country Inn at 800-938-5273 or visit www.rosewoodcountryinn.com. If anyone is interested in seeing moose, now is the time! The next few weeks will be the best and most productive time to see moose on Our Moose Licks Tour. This tour gives you some great opportunities to take photos of moose. There is no need to travel hours north in hopes of seeing a moose when central NH has a huge population of this magnificent animal. 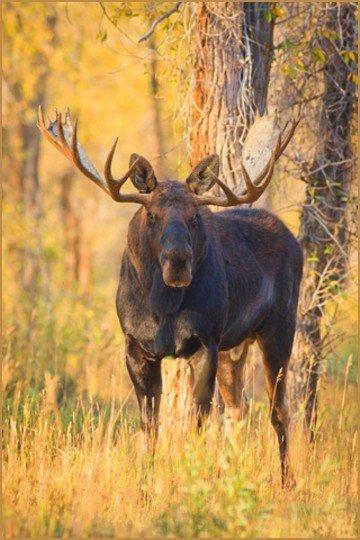 So grab your camera and and give us a call and lets go see some moose! Oh, one more thing, if you have never seen a moose calf only days after birth, there is a pretty good chance you will on a Moose Licks Tour! Key times of day for Moose Licks Tour are dawn to 9:30am or 6:30 to dusk; these are the best times to see moose on the move both to and from these roadside licks. Again, not much needed here. Bring a good camera maybe a set of good binoculars any food or beverages you may want (no alcohol). Extra layers of clothing can prove to be a bonus due to chilly mornings.